Q1) Brett why don't you tell us a bit more about yourself. Q2) So in terms of actually founding Streetcar how did that come about? Was that a conversation at university or ..
Q3) And as you were scaling the business I think I'm right in saying you got VC or even PE, (Private Equity) funding as you were starting it up? Q4) How did that exit come about? Was it something you were actively looking for, were you approached by Zipcar? Q5) Were they the biggest player? Q6) Was it quite a smooth transaction? Mike Bank: Hello and welcome to the latest edition of Digital Insight. My name is Mike Bank I'm here with Brett Akker. Brett why don't you tell us a bit more about yourself. 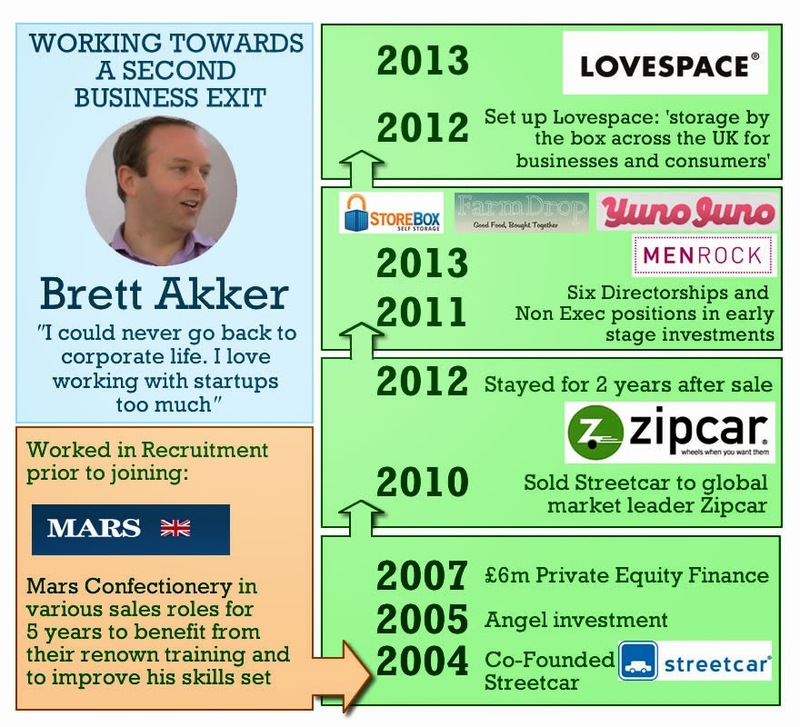 Brett Akker: My name is Brett Akker as you said, I founded a business called Streetcar about 10 years ago. Before that I was at Mars confectionery in various sales functions for 5 or so years and then launched Streetcar which was a PayAsYouGo car rental firm originally based in London and we expanded to 6 other cities. I founded that with a university friend Andrew Valentine. We founded that in 2004. Grew that from 8 cars and no members in London to about 1,500 cars and nearly 100,000 members as I said across London and 6 other cities. And we sold it to a company called Zipcar in 2010 where I remained for a couple of years before founding a new business called Lovespace. And I'm also involved in about 6 other businesses as an advisory or non-exec director capacity. Mike: So in terms of founding Streetcar how did that come about? Was that a conversation at university or ..
Brett: It was originally a conversation at university. We wanted to do something at some stage and then we got to 2002 and we decided we wanted to have a proper think about it. So we actually went through quite a structured process of meeting up for three evenings in the week and at every weekend to discuss potential business ideas, what was happening in the market, trends all these sort of things and went through probably 3 or 4 different business ideas before we just read an article actually about Car sharing generally in the States and across Europe and we just thought Wow! It was a great thing for London potentially. We thought if it was going to work anywhere potentially we thought London would be the best place in the world to work. So it was from that article that we really started thinking about it and then going through the planning process over the next 9 months or so before we launched it. Mike: a couple of things I'd like to pick up there actually. One is how much did it help you actually having a co-founder? Brett: I think we both hopefully say it helped a lot. I think in the very early days it was always very useful to have someone to bounce ideas off. In fact it was useful from day one to the time we actually sold the business. We both had different skill sets as well, so we complemented each other quite well which meant it worked very, very well throughout. So that definitely helped and also entrepreneurial life isn't always a bed of roses. It's not that easy sometimes. You have your Ups and you have your Downs and really it is quite a rollercoaster ride. So to have somebody there to share good times and bad times. You know when you have a terrible phone call or something like that, to be able to laugh about it afterwards. And learn from it obviously but just be able to talk things through with someone was hugely beneficial. Mike: So in terms the work that you were doing prior to founding Streetcar, did that impact your decision to move to the entrepreneurial world at all? Did it help? Brett: I think I was always going to head into the the entrepreneurial world I guess at some stage. It was just when I was going to feel ready to make that leap. So as I say we actually had the conversation at university to start with that one day we'd like to work together doing a a business so even then at 18 or 19 we were thinking about it. I then from university left and joined a very small recruitment firm for a couple of years. And again I was in a small recruitment firm in a brand new area. And again that was quite entrepreneurial in that I was building a new sector for this recruitment firm focussing on Middle Eastern local nationals recruitment. From there I learnt a lot about small business. How to do things well. How to do things that I guess I would have done slightly differently. And from there I very nearly actually considered starting a business at that stage but I felt I was missing a certain skill-set to be able to do that. So the reason I went to join Mars was they were renown for their fantastic training that they provided so that was the rationale from going from a very small business to actually a slightly larger business or a much larger business that provided that training. And then from there I felt after nearly 5 years I was in a much better place to start something myself. Mike: Presumably that helped as you were scaling Streetcar over the years that experience. Brett: Yeah definitely. When we sold Streetcar it was a very different animal all round from when we launched. When we launched obviously it was from my bedroom, pretty much it the early days. It was just the two of us and then we had our first employee after 5 or 6 months. And when we sold we probably had 220 or 230 employees and a lot more cars and a lot more locations and a lot more members so we tried to always maintain certain aspects of the business. Or the core aspects of the business or the core values of the business from day one to the day we sold. But obviously a lot of things had to change in the business in terms of how we did things. So thinking about how we were going to scale. Thinking about what that business was going to look like not just tomorrow but in six months time or in 12 months time is really important. So one of the best examples I guess in the early days is we used to meet every single member at the car and take them through how it works, check the driving licence. It was brilliant for the first 100 or so members. Because they met us and felt some sort of sense of ownership with the business and they told all their friends about it. It was fantastic about the word of mouth perspective. However when you've got 100 odd members signing up every day that clearly is not going to work so we had to obviously change how we were doing that and it was a lot more phone based. Well I guess web and phoned based by the time we sold the business. However making sure that we kept that sense of personalisation that we had in those early days was really core to the offering that we were providing. Mike: And as you were scaling the business I think I'm right in saying you got VC or even PE, (Private Equity) funding as you were stating it up, because in terms of starting it up to me it seems quite a capital intensive business? So how did you about raising the funds to start up? Brett: So to start up it was just our own savings because effectively we just leased the cars. So there wasn't that much cash needed for the cars themselves other than a deposit upfront. So the actual cash to start with was from us two but it was based on or spent on the tech sitting behind it. It was bought off the shelf, both hardware and software. So that was where most of the funds went to start with. We launched with our own funding of about £60,000 in April 2004 and then our first Angel round was the end of that year, the beginning of 2005. So we got a couple of hundred thousand pounds in at the beginning of 2005 and that was mainly for getting employees in. So getting our first three or four employees in to help us grow the business after various functions. And that lasted us until early 2007 and we got some Private Equity funding in. That was a much larger round about £6 million at that stage through a company called Smedvig Capital based in London. That was our big round. Mike: That got you through to sale. Brett: Through to sale in 2010. Mike: So you mentioned that your large round of funding got you through to exit. How did that exit come about? Was it something you were actively looking for, were you approached by Zipcar? Brett: It was actually luck more than anything else at the end. Because the CEO of Smedvig Capital, the Private Equity company that was involved with Streetcar happened to be in Boston and met up with the CEO of Zipcar. We had had a couple of conversations with Zipcar over the years where it didn't get any further than initial conversations. Mike: Were they the biggest player? Brett: Yeah, globally they were the biggest player and they had launched in the UK in 2007 I think it was but hadn't really grown the UK market that much certainly compared to what they had done in North America. So it was actually a conversation between the Smedvig CEO and Zipcar's CEO and it moved forward from there. I think Zipcar were looking to IPO in the near future and they saw the the UK as obviously growing their European share considerably. Mike: Were there any other potential acquirers for your business or had you though about IPOing yourself for instance? Brett: We were certainly approached over the years. We were approached numerous times from numerous different players from car rental industry to various others as well. We had a couple of conversations over the years, we had a couple of offers over the years but nothing that rally made sense to us at the time. But at the time we were speaking to Zipcar we didn't open it up to anyone else because we weren't actively looking to sell the business. We were just going to have a conversation and see where it went. It obviously went the whole way and we sold. Mike: Was it quite a smooth transaction during and after? Brett: Smedvig Capital were fantastic. John Hewett the CEO, they led a lot of the negotiation side of deal and did a fantastic job. So from our side it was relatively smooth and we could concentrate more on the day-to-day aspects of running the business. Because as soon as you raise money or you look to sell a business you get taken out of the business very, very easily. And not focussing enough on the day-to-day. So the fact that Smedvig ran that side of it meant that we could focus more on day-to-day which was good for us and good for the business. Mike: And post transaction was it a smooth integration with Zipcar? Brett: The integration was relatively smooth once we got past the Competition Commission process. We were referred to the Competition Commission and that lasted about 9 months which did take our eye off the ball I think with the business. and it took a lot of time getting through that but it did get through so by January 2011 we were clear of that and we could really focus on the integration and Zipcar could focus on their IPO as well. Mike: Thank you for that. 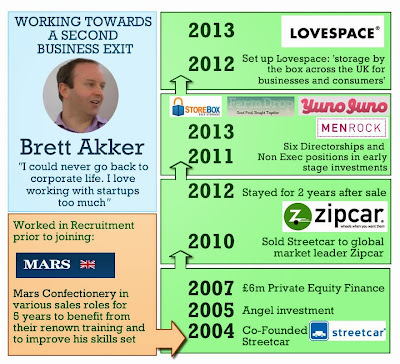 What we are going to do next is come back for part two where we are going to talk about Brett's second business, Lovespace. Nice thoughts consulting by both of you. Thanks for sharing such good things. If you want to hire best car in affordable pirce.Then Contact Us Now to hire Royal Ride car in affordable price.Pick and drop service is availalbe.